All load testing scenarios described here are just examples and are provided for reference. Consider updating them to reflect your environment. All our load testing scripts use the utilities module utils.js which provides reusable data structures and functions. To establish a baseline, first we’ll load test the website’s home page with one concurrent user. This will allow us to see the best performing numbers, against which we’d compare more advanced scenarios involving more pages and more concurrent users. We assume that we want the website to handle 50 concurrent users. We just loaded the website with 41.106944 requests per second. Let’s increase the number of iterations to hit the home page with approximately 50 requests per second. 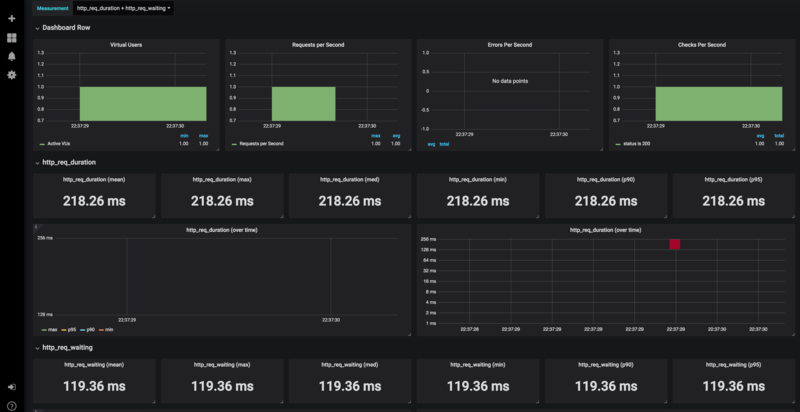 We can conclude that with the current CPU and memory configurations for Kubernetes pods, the site can handle 50 requests per second to the home page.